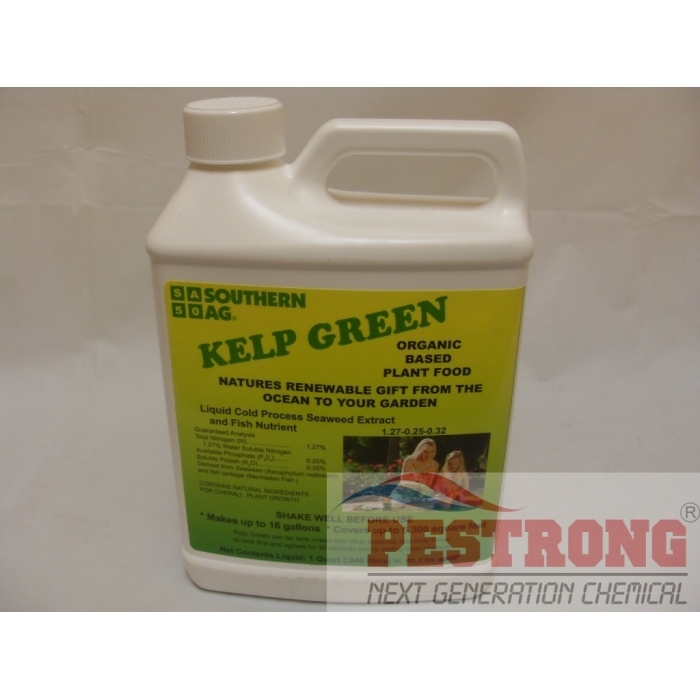 Where to Buy Kelp Green, Kelp Green Liquid Organic Fertilizer - Qt - $13.55 for Sale with Fast Free Shipping! Kelp Green Liquid Organic Fertilizer - Qt is organic based plant food which liquid cold process seaweed extract and fish nutrient. Plants have a greater resistance to nematodes, disease and pests. Foliar Spray on All Plants, including Flowers & Vegetables: Mix 2 - 3 oz per gallon to cover 25 sq.ft. Apply every two or three weeks during growing season. Lawn and Turf: Mix 6 - 16 oz per 2 - 5 gallons of water to cover 1,000 sq.ft. This one(1) quart can cover up to 5,300 sq.ft. Apply 4-6 times during growing seasons. This one(1) Quart can make up to 16 gallons covers up to 5,300 sq.ft. I needed a good fertilizer, but this happened to be a great product. I used it on my lawn and they look great now. This is my 2nd order. I have used chemical fertilizer before try this. After I used this kelp, The lawn and shrubs turned dark green and looks more healthy. This is best fertilizer.